First I would like to thank you for coming to Garys' page. Thank you for reading it all the way through. I know it is long, but I couldn't see how else to tell his story, so far. 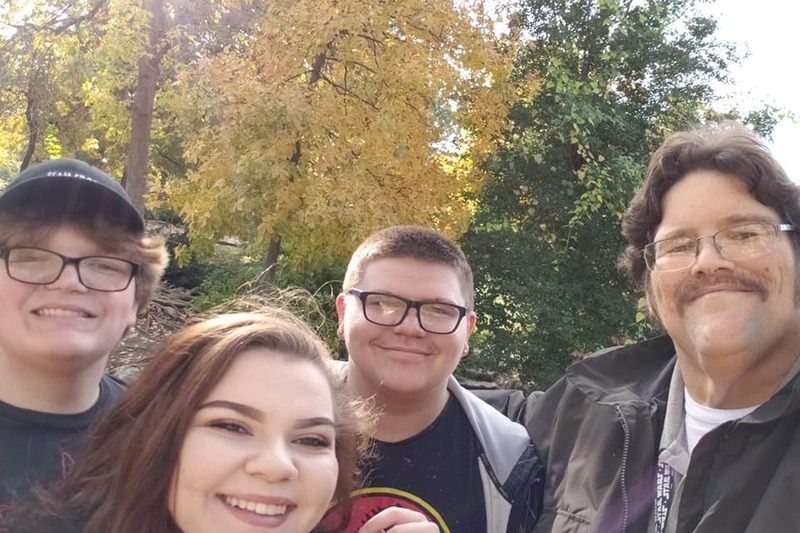 If you are able, please consider sending a donation to help my son, Gary, with mounting medical bills No amount is too small. Whether or not you are able, please share his story with your family and friends. You can Facebook, Tweet, text , phone and more ways I don't even know about.. Also, please keep him in your hearts, thoughts and prayers. "GeeD is the most wonderful person I know." This is actually how I always introduce him to people. Gary (GeeD or GD to many of us) has cirrhosis and liver cancer. The cirrhosis is most likely due to diabetes, fluid retention, obesity and other factors. His doctor, in Tulsa, referred him to a specialist at the INTEGRIS Nazih Zuhdi Transplant Institute in the Baptist Medical Center in Oklahoma City. At his first appointment the doctor said that Gary would need a liver transplant as soon as possible, but first certain things must happen. The first of which would be to destroy the cancer. At this time there was just one tumor. He would have a much better chance of meeting the criteria. Liver transplants cost $575,000.00. During the next few trips he had an MRI to see the exact location of the cancer, and other tests. the radiologist preformed an *ablation to destroy the tumor. He told us that he would need a second ablation. *Tumor Ablation and Embolization: These techniques can be used to treat some tumors in the liver. Ablation involves using heat, cold or other methods to destroy tumors rather than removing them. Sometimes this is combined with radiation (radioembolization) or chemotherapy (chemoembolization). and his other doctors met and concluded that the embolization would be too risky . His fragile liver might fail. They are now deciding what the best way is to proceed. As of now he is still not a candidate for transplant surgery because the tumors are multiplying. We are awaiting the results of more tests. In the beginning of January Gary was hospitalized twice. The first time he was in excruciating pain. His gallbladder was inflamed and a gallstone was removed from the common bile duct. The second time, a week later, the excruciating pain returned, but the cause was not his gallbladder. There were more tumors found in his liver. He is very jaundiced because his bilirubin count is three times as high as it should be. He has lost over two hundred pounds. He is losing weight, still, because his appetite is so poor. He has not been able to work since he has come home from the hospital. He does not get paid sick leave. In 2018 his health insurance was completely inadequate for his health needs. He didn't know at the beginning of last year that he would need so much more insurance. His medical bills during the last half of 2018 reached in excess of $50,000. The hospitals and doctors in Oklahoma City were OUT OF NETWORK. He has applied for financial aid. All his doctors and the hospital in OKC are IN NETWORK this year. This should save some money. The bills haven't started to come in yet. Each trip to Oklahoma City is 100 miles each way. He has a small car. The rides are taking their toll on him. We have to borrow my other son's van so he can be a little more comfortable. We must be extremely careful with money now because there is the cost of gas, food, hotel stays (if necessary) and other expenses to take into account for each trip. Now that he can't work, he is applying for 100% disability. He was told that, although he definitely has the need, this process could take four to five months or more. He is very worried about how I will pay our other bills. Gary and my daughter Jessica and her boys live in my house . They, along with my son Michael helped me take care of their dad when he was so ill. They got him to dialysis, doctor appointments and they took care of him at home until he died several years ago. 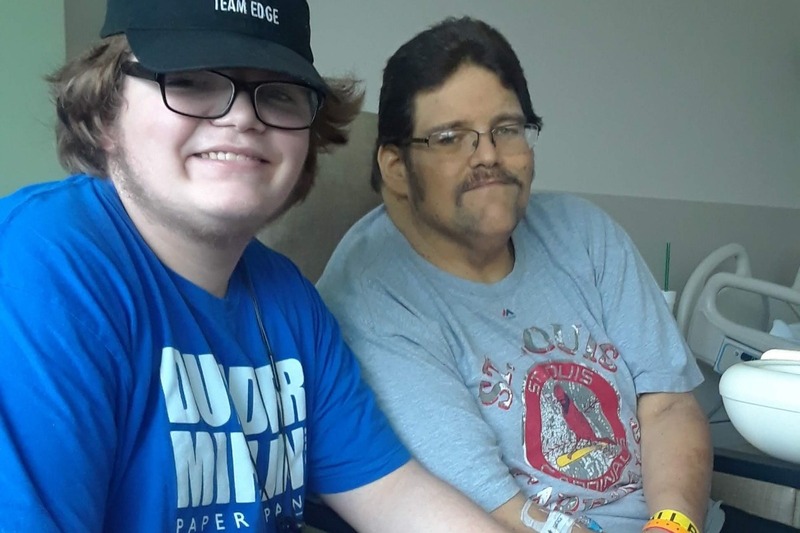 We, his family, have known about the cirrhosis and cancer since each diagnosis but Gary didn't want anyone else to know until after his first appointment in OKC, then he extended the date. Those of you who know Gary, know that he does not share things about himself; you have seen the changes in him and wondered why. He just wasn't ready to say it aloud. Family is everything to him. When two of his nephews needed a father figure, he was right there. These boys are so lucky because Gary is the best father any child could want. He, also, does many things with and for his other nephew and niece. When he was eight years old, Nathaniel (oldest nephew) decided that he loved bowling. Gary learned everything he could about the sport. He took Nathaniel to practice, league and tournaments. Since some of the tournaments were in other states, GeeD did everything in his power to make sure he could afford to take him. He was there every step of the way for Nathaniel. Nathaniel is now in the adult leagues and has bowled ten perfect games`.Gary still goes to his tournaments when he is feeling well enough. Cale is a very talented baseball player. His dad and mom make all of his league play possible. Adi loves to sing and is in the school choir. She has the voice of an angel. She is also an artist. Hunter is an artist and a nerd through and through. These three teenagers go to the same high school. Gary picks them up many days and takes them places, like Woodward Park. He said he took them there as a punishment for being teenagers. He took picturest to prove it . GeeD has a very weird sense of humor. Truth be told, he just loves to do things with them. Gary has loved taking care of Cales,' Hunters' and Adis' nerd side. They would go to comic stores once a week to browse. They have gone to Comic Cons. He is a wonderful artist. His dream was to meet Stan Lee and he did when Hunter won two tickets to a Con in Dallas a few years ago. He was like a happy little kid to be near his idol and to have that lifelong memory captured in a picture. He called home to tell us all about it. Friday night is Nerd Night. They would play Dungeons and Dragons. Playing this game costs him nothing and they have a wonderful time. He had to cut back on the comics and other nerdy things because of the cost. Gary has always been here for Jessica, Michael and me. He took over the bills and day to day worries when I was diagnosed with Lymphoma in 2016. I am in full remission now, just in time to take that burden off his shoulders. He has never turned down anyone who has needed help or a shoulder to cry on. He has some pretty broad shoulders. When GeeD told us both diagnoses he was very composed. He started to cry only when he talked about the thought of leaving Nathaniel, Cale, Hunter and Adi. I honestly don't know a total amount to try to raise. I decided that this is a good starting point. *I pray that the cancer will be gone. *I pray that he will be put on the transfer list as soon as possible. *I pray that a liver will become available as soon as possible. *I pray that GeeD will be nerding for many, many years to come. I will post updates as soon as I know them. GeeD urgently needs your help. Please donate if you can. Thank you for reading his story (so far) and please help me share it by tagging friends, telling them about it, tweeting friends, email, call, linkedin, text... etc. Please share your memories of GD on the Serenity site. serenitytulsa.com. His Facebook page will remain open,. There are hundreds of memories on his page. We are not surprised. Thank you again. We want to thank everyone who knew and love GD. Your love and friendship meant everything to him. We miss him every second of every minute of every hour of every day. My sweet, awesome GD passed away on Tuesday Feb 5th. We have many financial obligations to meet, including his funeral. Please donate if you are able. There will be a memorial service at 1pm, Serenity Funeral Home in Tulsa. Thank you so much for your prayers, love and kindness. Gary was admitted to St. Francis, again, today. He is in pain. His bilirubin (liver) is high and so is his creatnin (kidney). An oncologist will be in to see him tomorrow. I will keep updating.